This guide will show you how to sideload Fire TV applications and I will demonstrate two easy ways to accomplish this task. Sideloading is the process of installing Android applications onto the Fire TV or FireStick that aren’t readily available in the Amazon app store. Since the Fire TV utilizes the Android operating system, it is possible to sideload Android applications onto the device. There are thousands of Android applications that aren’t available in the Amazon App Store that work great on the Fire TV or Fire TV Stick. The two methods outlined below will show you how to easily install them, or I should say “sideload” them. It is strongly suggested that you watch the videos for each method as steps will be covered in detail. The written instructions below the videos are summaries of each process. The first method involves utilizing the Aptoide TV Application on your Amazon Fire TV or FireStick. You can think of Aptoide as an Android app store very similar to Google Play. You will install this new app store onto your Fire TV device and then choose the Android applications that you would like to sideload. Within Aptoide TV, you will find many Android Applications that aren’t available in the Amazon App Store. One of the most popular sideloaded applications is Kodi and you can easily install that through this remote-friendly application. In my opinion, this is the easiest method of the two since it doesn’t require using a computer to sideload the Android Applications to your Fire TV or FireStick. 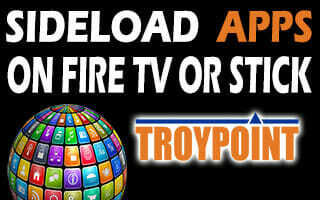 Open Aptoide TV and search for the Android Applications that you would like to sideload (install). The second method involves downloading the Android application (.apk file) onto your computer that you would like to sideload over to your Fire TV or Fire TV Stick. You will then use a free program on your computer called adbLink that will allow you to easily transfer the application over to your Fire TV/Stick. adbLink may be used on Windows, Mac, and Linux. In the video below, I am sideloading the same program that we install in the first method above called Aptoide TV. 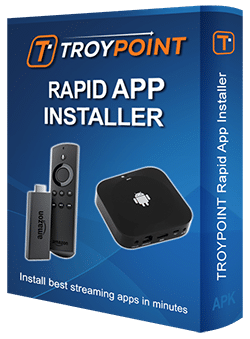 Once this application is installed on your Fire TV or FireStick you will be able to use this alternative app store to get your Android applications. Download the Android .apk file that you would like to install onto your computer. Within ADBLink click the Install APK menu item, browse for the .apk file that you downloaded in the previous step and select it. You will receive a success message once the application has been installed. How do you turn off subtitles? Hi – I have a fire stick w/ Aptiod on it but I am trying to install YouTube TV (The paid service not plain YouTube) I can get the apk and use adblink but it still asks for Google Play Services – I tried to load GPS via adblink APK but and it says it was successful but it still wont work. Any suggestions? I’m looking into installing Popcorn Time onto my Amazon Fire TV box. Do you have a video showing how to do that? Thanks…..